Your family can make a difference in the life of a child in a developing nation by sharing God's love through the power of a simple shoebox! Riverview is encouraging all our families to participate in Operation Christmas Child as your family's mission project this November. Samaritan’s Purse works with local churches and ministry partners to deliver the gifts and share the life-changing Good News of Jesus Christ. Pens, pencils and sharpeners, crayons or markers, stamps and ink pad sets, writing pads or paper, solar calculators, coloring and picture books, etc. Small cars, balls, dolls, stuffed animals, kazoos, harmonicas, yo-yos, jump ropes, small Etch A Sketch,® toys that light up or make noise (with extra batteries), Slinky,® etc. Used or damaged items; war-related items such as toy guns, knives or military figures; chocolate or food; out- of-date candy; liquids or lotions; medications or vitamins; breakable items such as snowglobes or glass containers; aerosol cans. Use an empty shoebox (standard size, please) or a small plastic container. You can wrap the box (lid separately), but wrapping is not required. Most importantly, pray for the child who will receive your gift. Fill the box with a variety of gifts that will bring delight to a child. Use the gift ideas provided on the bottom of this page. Please include at least one item a child can immediately embrace such as a stuffed toy, doll, ball or toy truck. 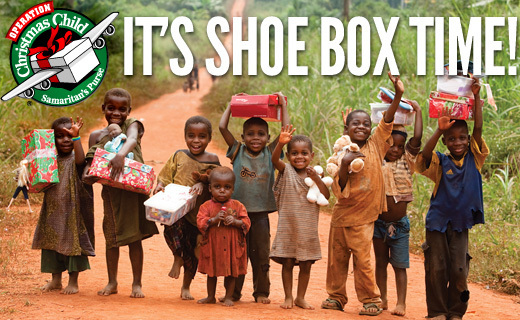 Please donate $7 or more for each shoebox you prepare to help cover shipping and other project costs. You can give online by using our “Follow Your Box Donation” option, or you can write a check to Samaritan’s Purse (note “OCC” on memo line) and place it in an envelope on top of the gift items inside your box. 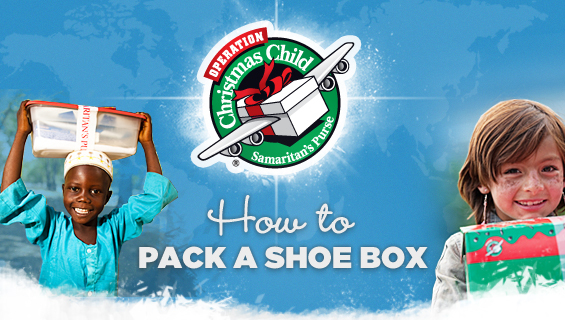 If you or your family are preparing more than one shoebox, please make one combined donation. Bring you shoe box to the church no later than Sunday, November 24, 2013. We will dedicate each box to the Lord and pray over them before the TeamKid Ministry delivers them to Trinity Baptist Church after service.